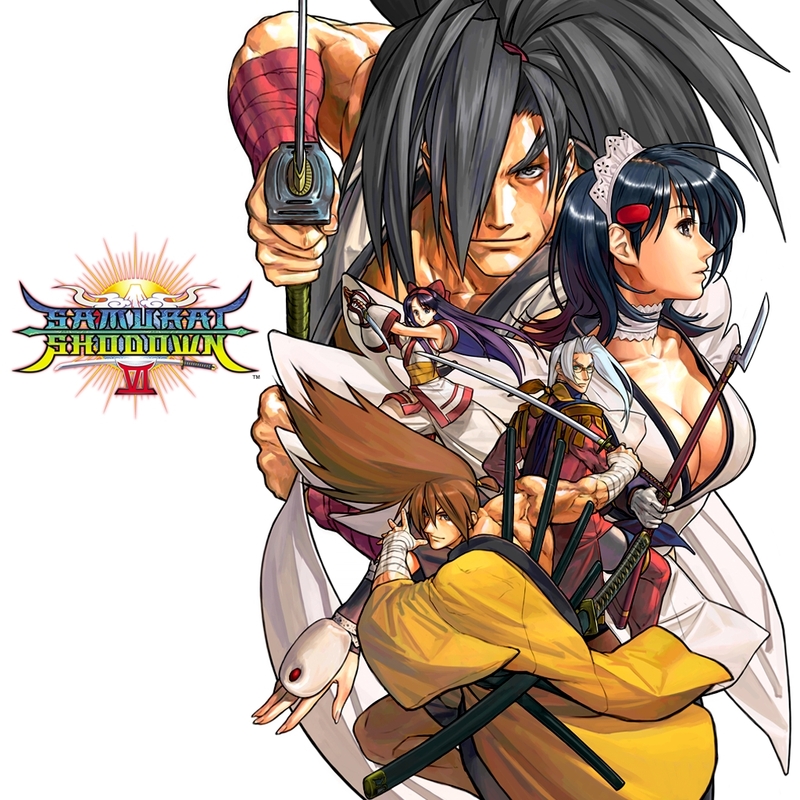 REVIEW: The tenth installment to the long-running Samurai Showdown series is known as Samurai Spirits Tenkaiichi Kenkakuden in Japan (Samurai Spirits Tenka for short), simply called Samurai Shodown 6 in America. 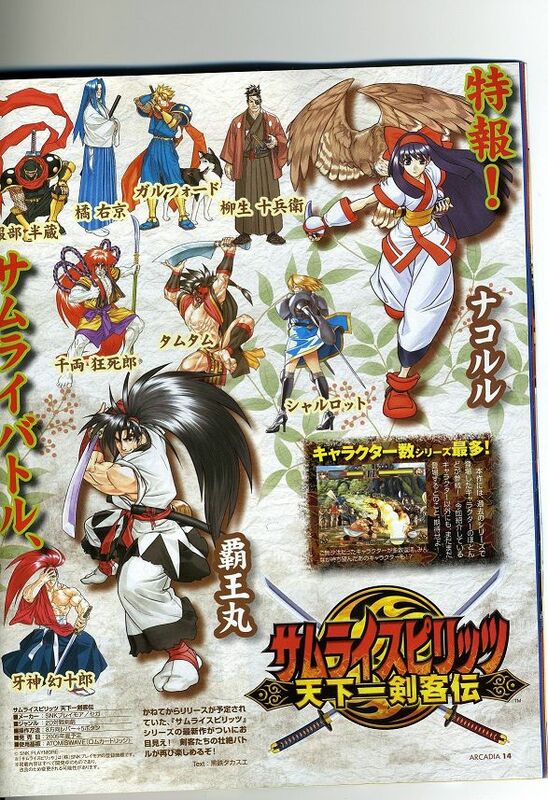 SS6 brings back all 28 characters from Samurai Shodown 5 Special, and also marks the return of several classic characters from the series that haven't been seen since Samurai Shodown 2 including Gen-an, Earthquake, Wan Fu, and Sieger. 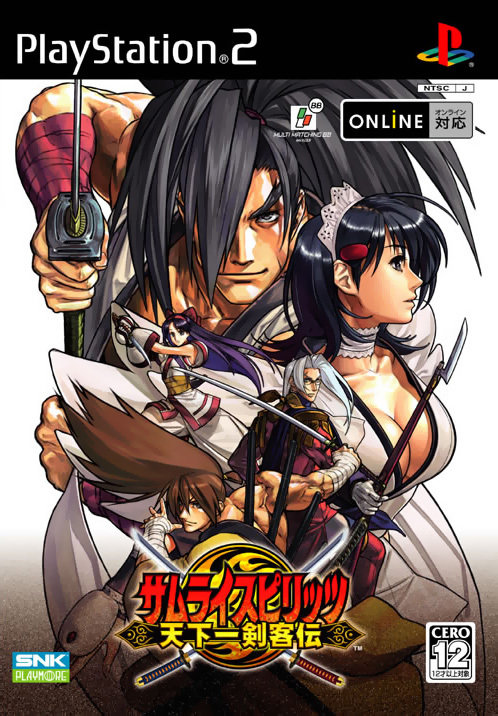 Along with the returning favorites, joining the roster are several newcomers such as: Iroha, Andrew, Soguroku, and Ocha Maru; alternate versions of classic characters, and even a handful of animal characters (now playable by themselves for the first time) which easily makes for the biggest roster in the Samurai Shodown series to date... 52 selectable characters in all, though quite a few are still "palette" swaps. 52 characters in all... whew! 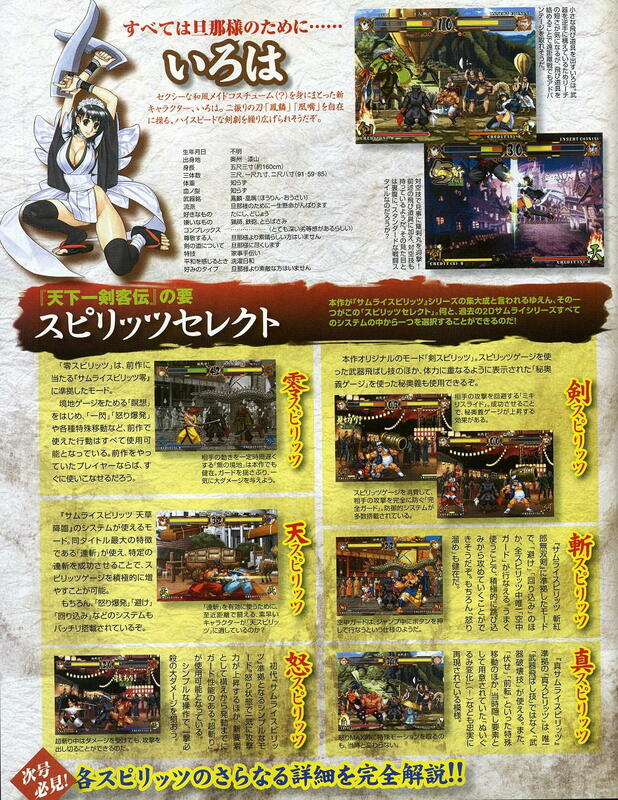 Although "Bust" and "Slash" versions of characters are a thing of the past, SS6 introduces the "spirit select" system that allows players to choose between nine specific character settings which tweak your character's abilities and play style. 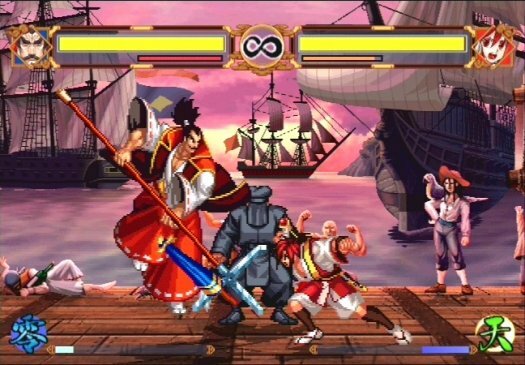 Depending in the "spirit" mode you select, your character will be capable of doing different things during a fight, such as being able to knock away your opponent's weapon or break it all together. 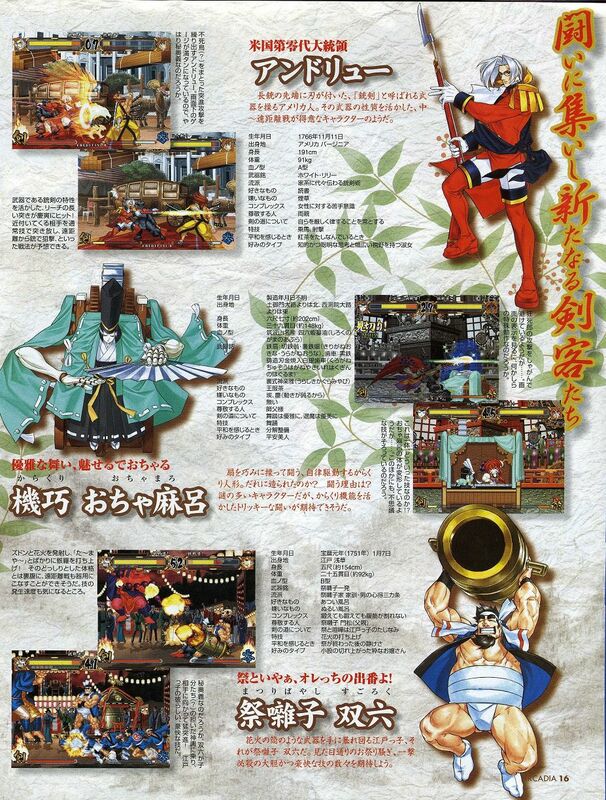 Special attacks, defense/evading techniques, and even combo possibilities differ depending on the "spirit" you select, which adds a lot of diversity to the game on top of the vast character roster. Pirates of the Caribbean stage. 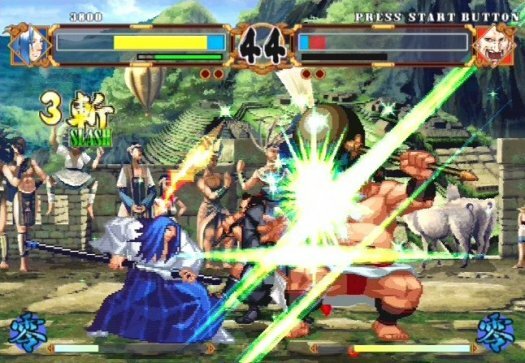 SS6 isn't nearly the best looking 2D fighter around but it isn't bad, although previous installments do look mighty similar and possibly even "outshine" this version graphically. The stages of SS6 are refreshingly different, and have a really "sharp" appearance which is both a good thing and bad thing in some ways. 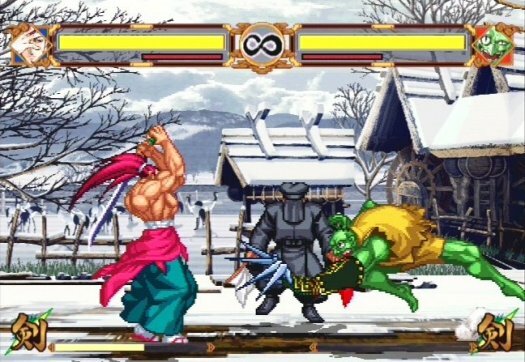 The scrolling effect that many 2D SNK fighting games are known for is back once again, and does appear to be " smoother" than ever, but due to the sharp backgrounds, the "pixelation" stands out a bit more than usual. 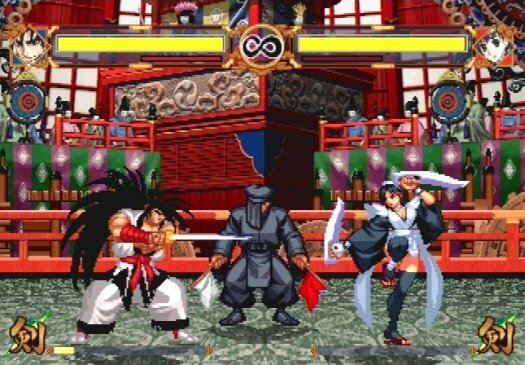 The past backgrounds in the Samurai Shodown series have always been hand drawn, and were no doubt incredibly "moody" and simply beautiful... SS6's stages aren't bad in comparison, but they're somewhat on the gritty looking side and the background characters appear quite stiff to say the least. 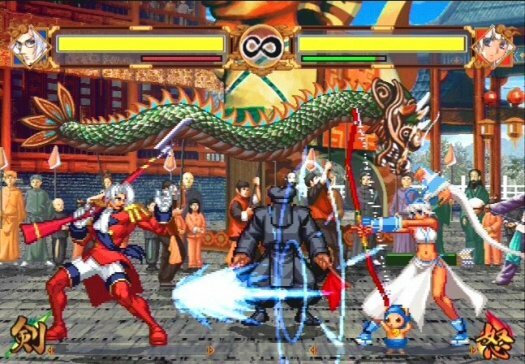 No doubt backgrounds in previous games were far more memorable, and I would have actually much rather seen Samurai Shodown 6 packed with classic locations rather than entirely new ones. The new BGMs are pretty cool, and the redone voice acting is also well done and noticeably different, but again slightly pales in comparison when compared to the series' past. 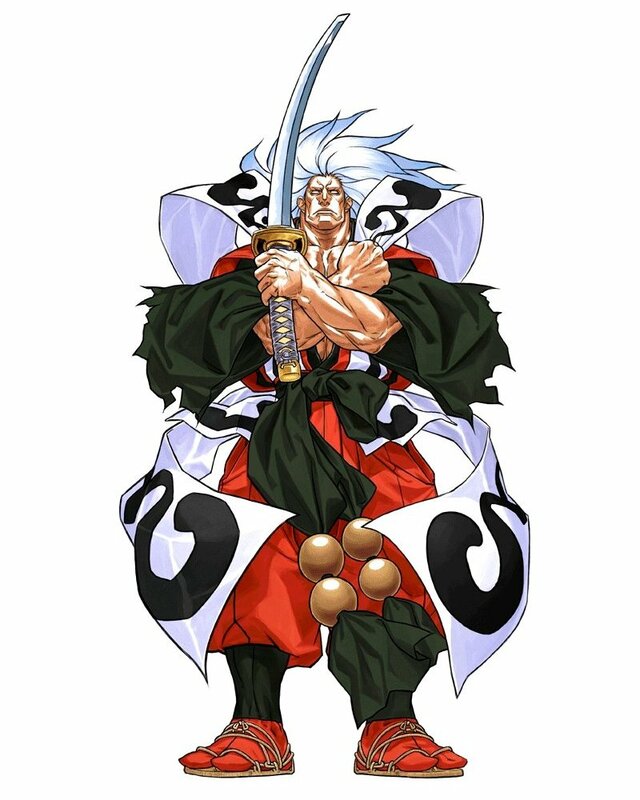 These two haven't met since Samurai Shodown 2! 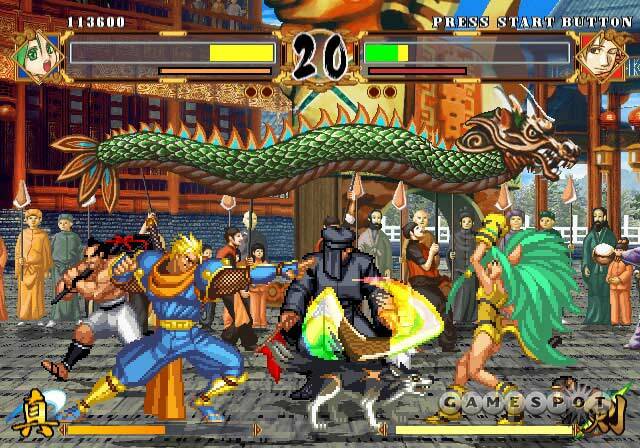 Sadly, there's no blood in SS6... and even more depressing, no fatalities. It's weird that they took out such a staple element of the series... I mean, how could they leave out the epic, stylish, slow-mo fatalities that the series was known for? 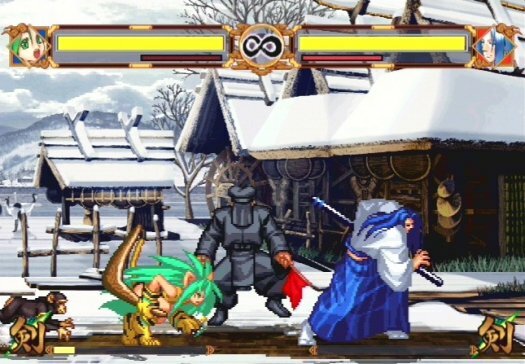 The question whether or not your opponent will actually die on the final blow adds so much suspense and style to game (on top of realism) and it's a bloody shame they decided to do away with it yet again. 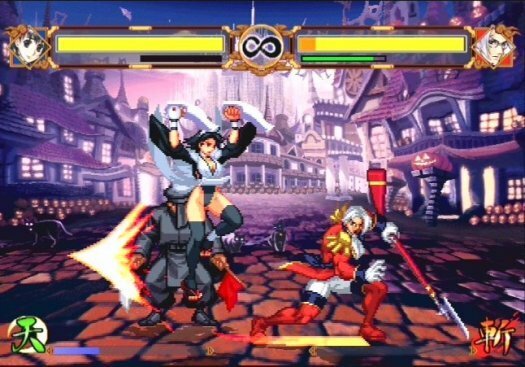 There are at least a wide variety of cool looking hit effects, and do justice to make the moves look like they hurt... but no blood. 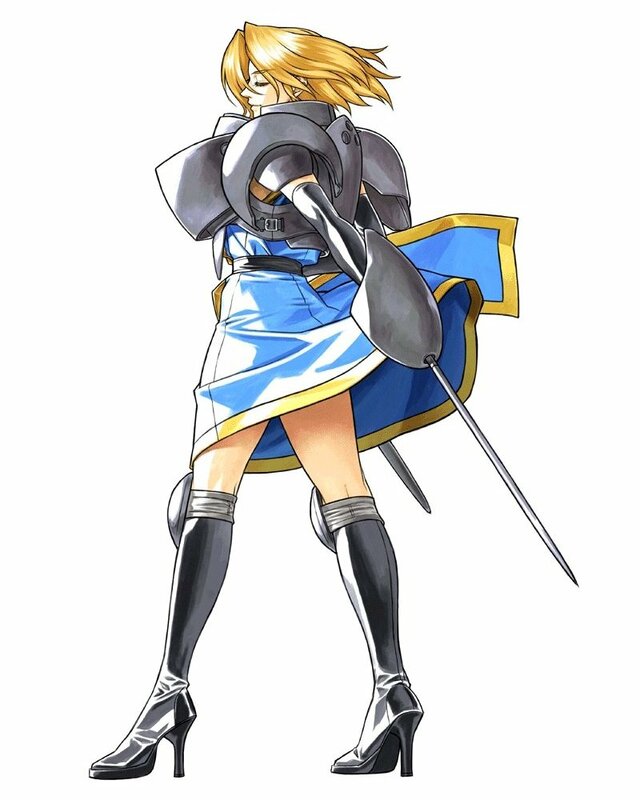 Samurai Shodown with no blood... *sigh* It's not like they're going to offend anyone nowadays... is the teen rating that important to you SNK? 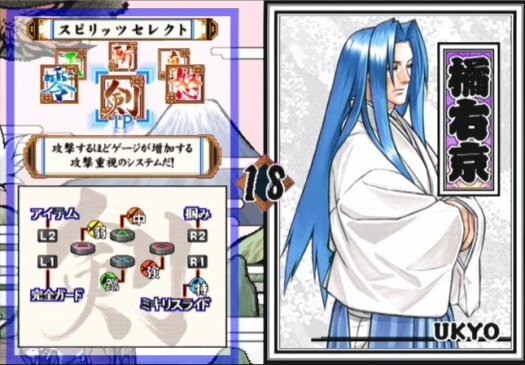 I'm glad Kuroko is back at least, and the delivery guy that throws in items from the background (whom now throws in sub-weapons which can be picked up and tossed at your opponent). Cosmetic details aside, the gameplay is still enjoyable and feels like a mix between all of the previous installments... it's kinda weird actually. The game is smooth, yet slower in some places than it probably should be, but still has that "pace" that the series is known for. 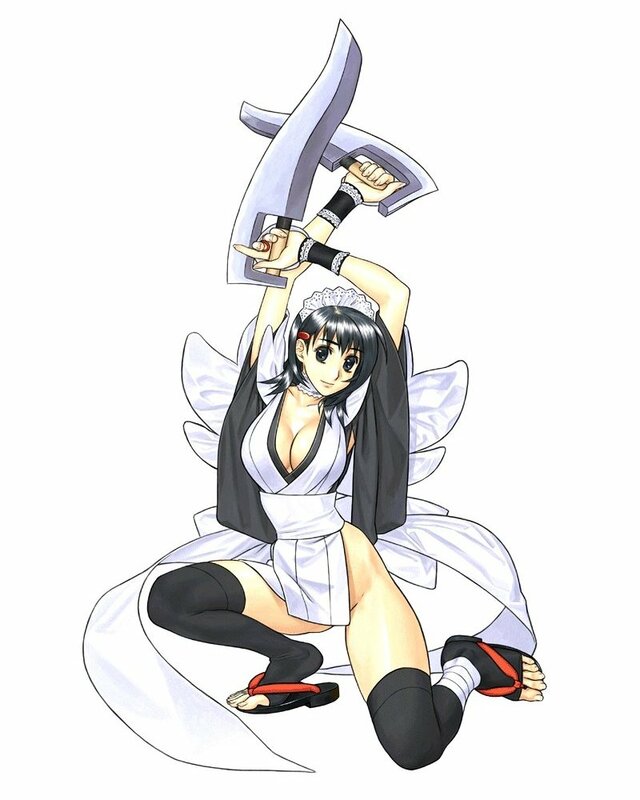 Many characters have been toned down from previous versions, obviously to balance out the game.... Balance is good, but what about fun? 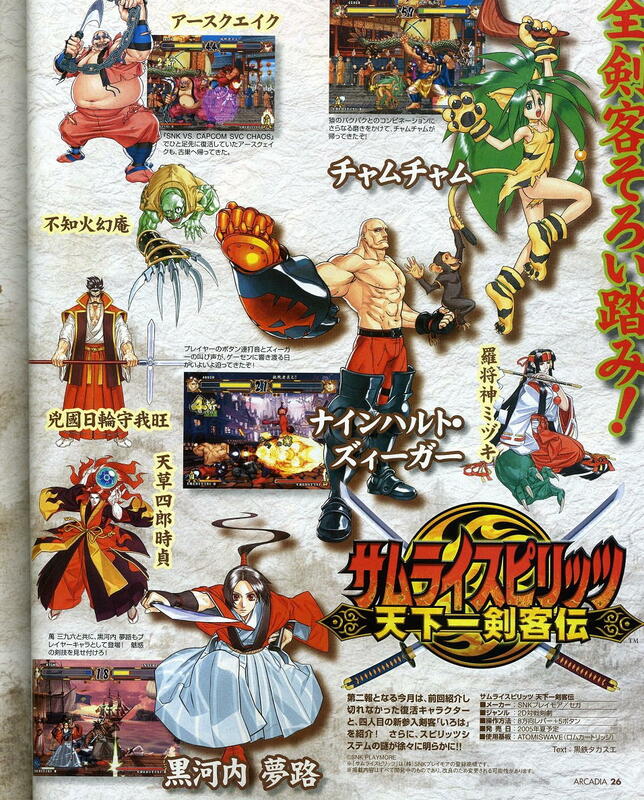 Honestly, many of the classic characters were more fun to use in previous games. 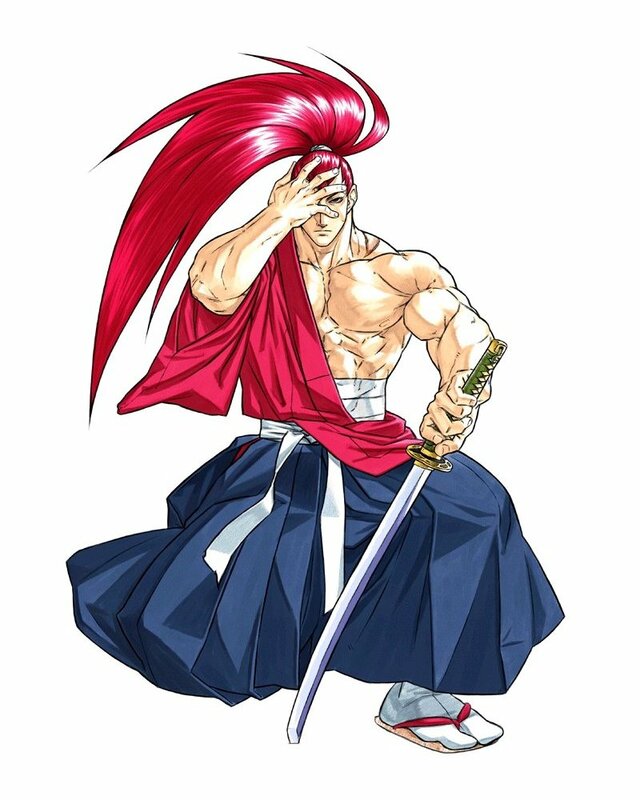 You can still "make it work" with your favorite character, but he or she most likely isn't going to play quite as you remembered, and will likely feel toned down if you were any sort of Samurai Shodown player in the past. 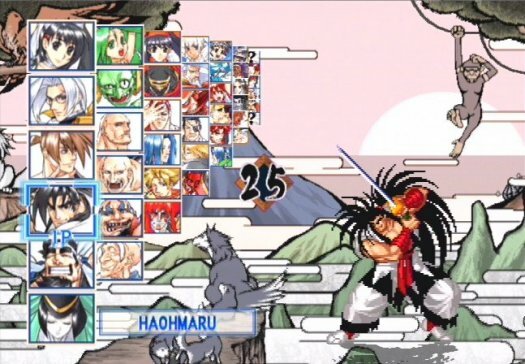 It's also a shame there aren't really two versions of each character like we had in SS3 or SS4, but the new spirit select system is certainly better than nothing. 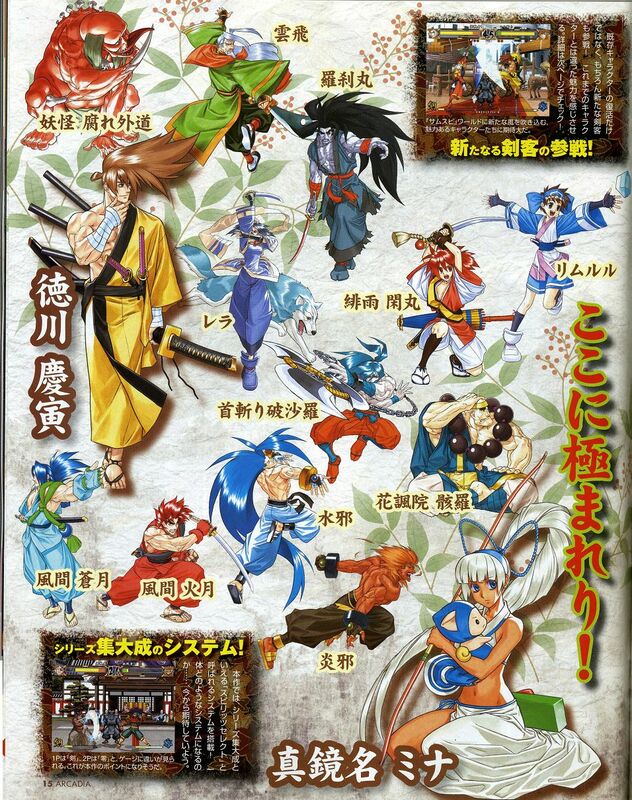 Samurai Shodown 6.... Nope, the series isn't quite where I'd hoped it'd be by now. 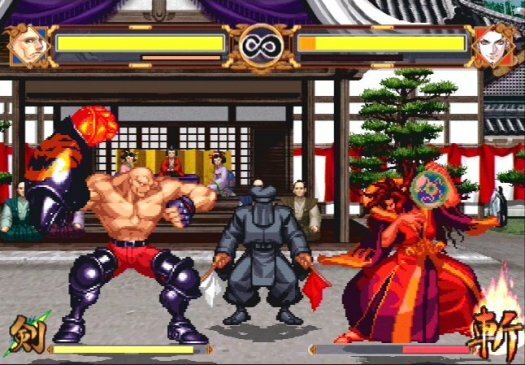 Really, the character sprites are still the same sprites that we saw in Samurai Shodown 3, and some of which ironically, don't animate quite as fluidly as in that game (not as many frames). 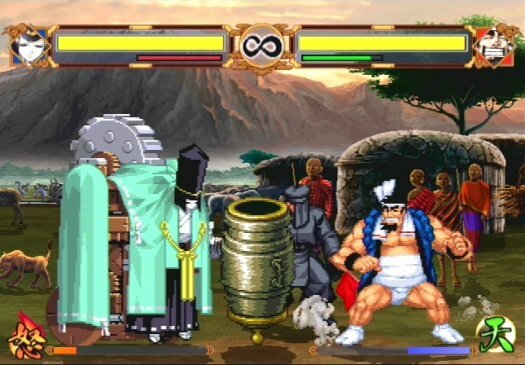 I suppose that's because the sprite artists wanted to have an "orthodox" frame count, so they took frames away from characters who had more to match the new characters they were introducing... 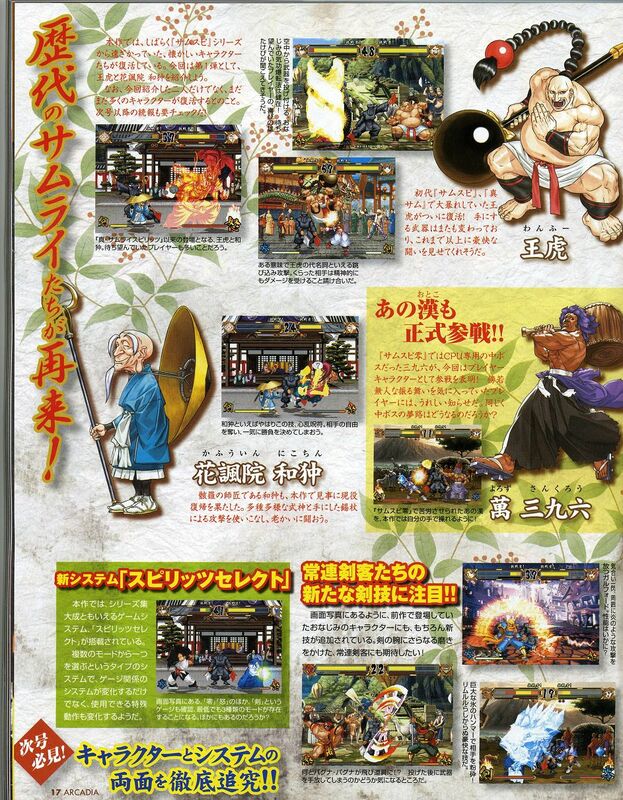 It's understandable (and lazy) and at least it gives good reason to go back and play SS3. Overall the game animates well, but the overall animation has been done slightly better in previous games, which is odd.